MONTGOMERY – We’ve all heard the saying, “Eat your veggies,” but have you ever stopped to think exactly why we say it? It’s not just because our parents told us to. There’s scientific fact behind the benefits of loading up on those garden goodies. 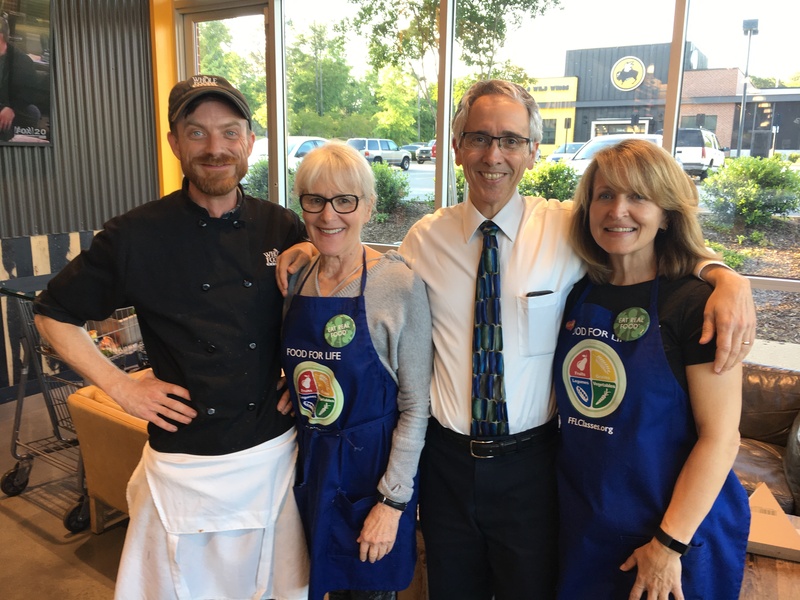 Montgomery physician Bryan Strickland and his wife, Carolyn, were not only impressed by the results of switching to a plant-forward lifestyle – they are passing their knowledge along to others hoping to reap the benefits of plant power. For the Stricklands, it all began with The China Study, a study which examines the relationship between the consumption of animal products, including dairy, and chronic illnesses such as coronary heart disease, diabetes, breast cancer, prostate cancer and bowel cancer. The authors of the study concluded that people who eat a predominantly whole-food, plant-based diet, avoiding animal products as a main source of nutrition, including beef, pork, poultry, fish, eggs, cheese and milk, and reducing their intake of processed foods and refined carbohydrates, will escape, reduce or reverse the development of numerous diseases. “About 10 years ago I read The China Study, which is the largest study on nutrition and health. It was an amazingly well-done study that looked at how nutrition impacted human health and health problems, most specifically cancer, over a 27-year period. When I read the study I was fascinated by it so I told my husband about it. Then we watched the movie Forks over Knives, which also looked at the impact of food on our health. That’s when Bryan and I really decided we needed to change our eating habits,” Carolyn said. For Dr. Strickland, he felt this was a case of “physician health thyself.” The time had come for him to take the advice he was offering to his patients and put it into practice for himself. 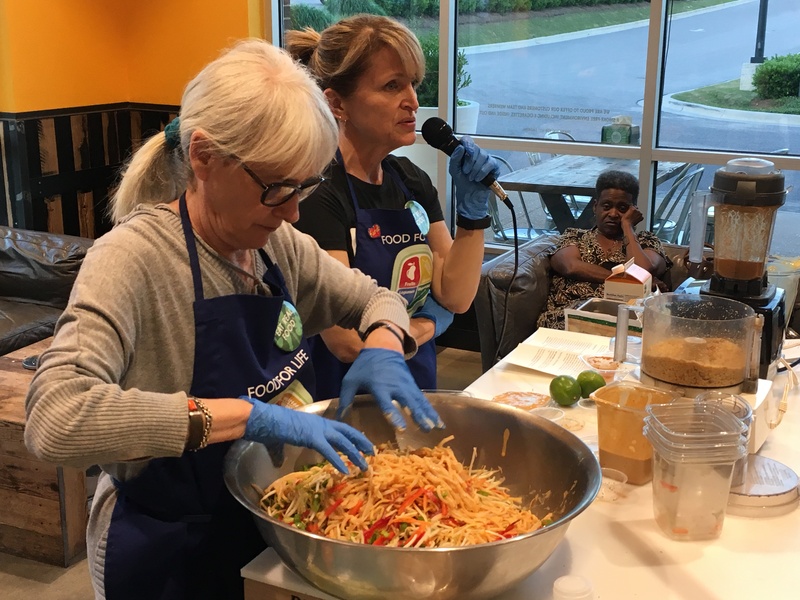 Carolyn, who is also president of the River Region Medical Alliance, wanted to get more involved, so she became a certified Food for Life Instructor through the Physicians Committee for Responsible Medicine. The Physicians Committee for Responsible Medicine is a nonprofit organization steered by medical professionals advocating education and research in an effort to change the way chronic diseases such as diabetes, heart disease, obesity and cancer are treated with a focus on plant-forward nutrition. 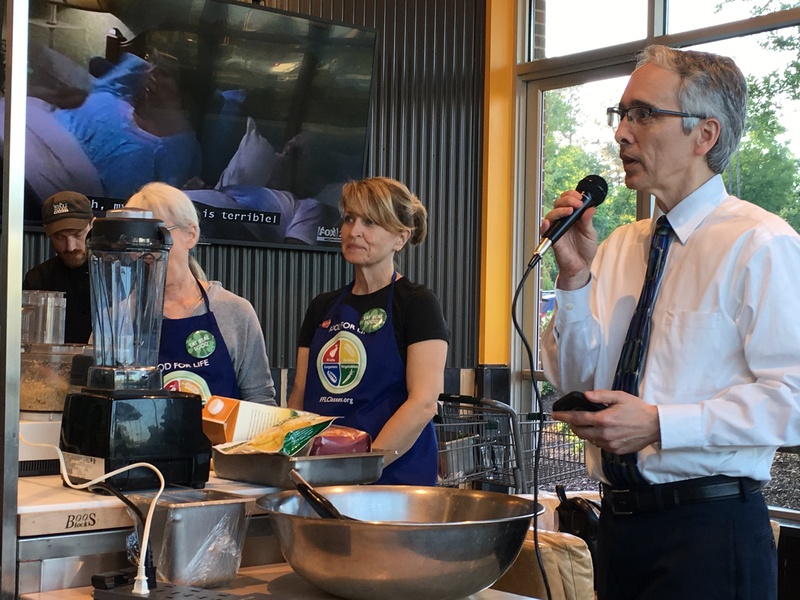 With Dr. Strickland’s already busy office filled with patients who could use what he and his wife were learning about a plant-forward diet, the next logical step was to find a partner willing to host cooking demonstrations. So, Carolyn contacted Jason Autry, Mission & Purpose Field Specialist with Whole Foods, and the Meatless Monday Supper Club was born. “If a physician tries to go out into the community alone to do something, you don’t accomplish as much as you can if you enable a team who can work together,” Dr. Strickland said. “The key to getting the word out about Food for Life is definitely with teamwork. 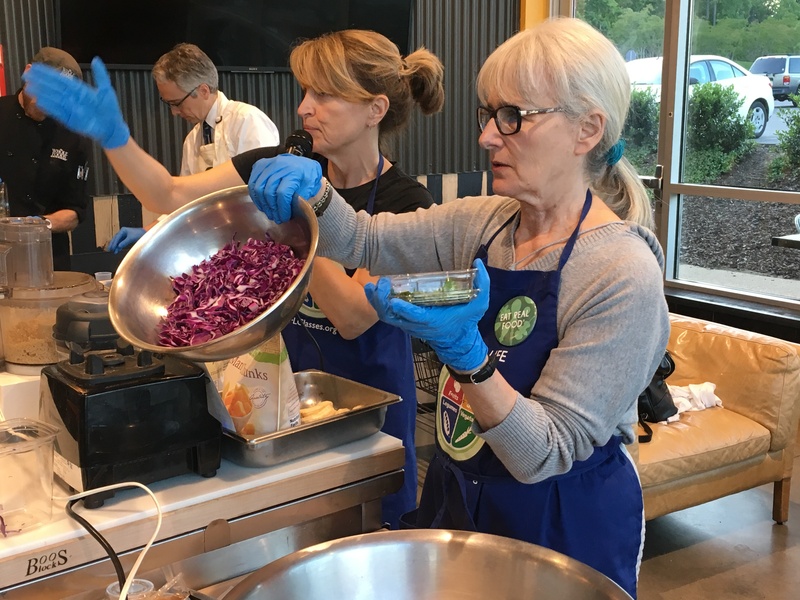 The Stricklands work with Jason and Bari Levin, who is also a Food for Life instructor, to prepare plant-based meals with a purpose for each Meatless Monday dinner event. 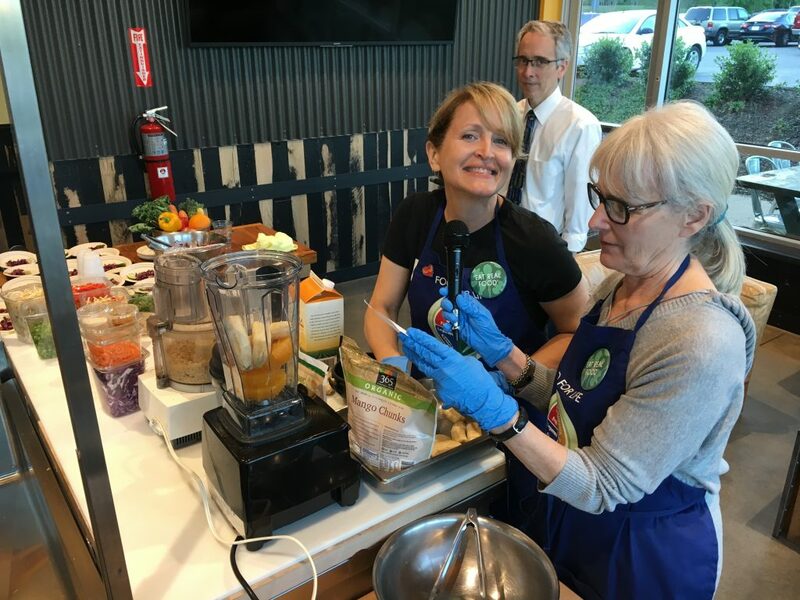 Most events have an educational theme, such as diabetes, in which Dr. Strickland offers a bit of medical advice and how the benefits of changing a person’s eating habits can bring positive health changes as well. 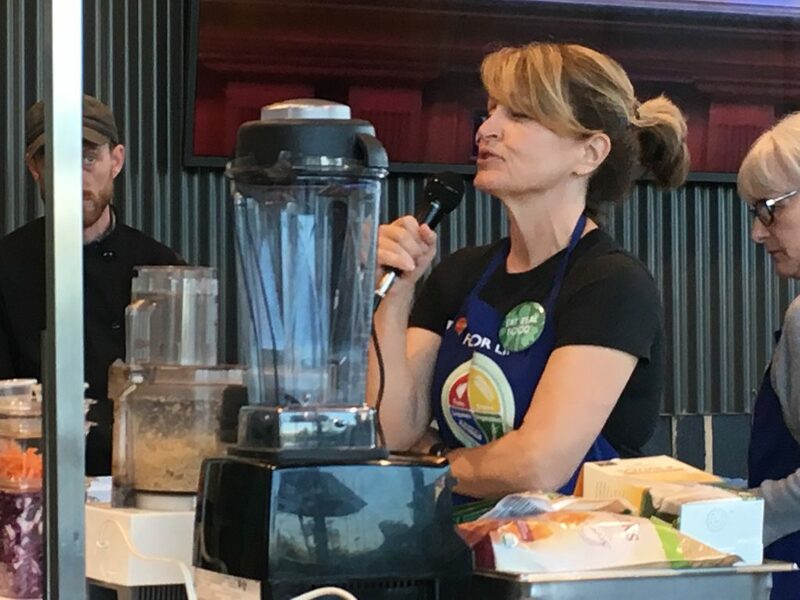 For Carolyn, Jason and Bari, their mission is not only awareness of the health benefits of eating your veggies, but also to break down the misconceptions that eating a plant-based diet can’t be fulfilling or even tasty. 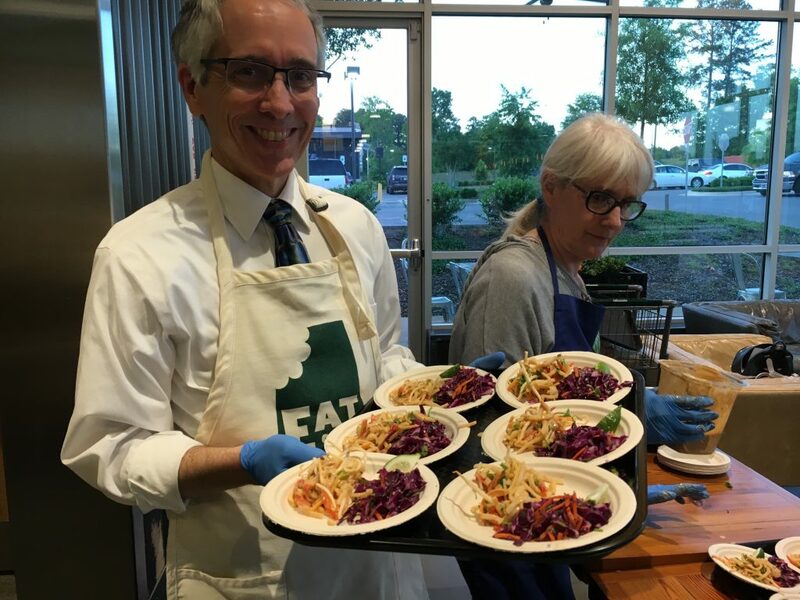 The Meatless Monday Supper Club at Whole Foods in Montgomery meets on the last Monday of each month at 6 p.m. and it’s free. Visit Whole Foods for details. *Before beginning any new diet or exercise regime, please consult your physician. This dish has all the flavor of traditional Pad Thai and is low in fat. In a blender, combine water, nut butter, lime juice tamari (or soy sauce), ketchup, coconut nectar or maple syrup, ginger, garlic, salt and red pepper flakes. Puree until smooth. Set aside. Cook the noodles according to package directions. Once just tender (do not overcook or they will become mushy), drain. Add sauce to the cooking pot and place over low heat. Add the cooked noodles, red pepper, carrots and green onion. Mix until noodles are coated evenly. Once warmed through, add sprouts and cilantro. Top with peanuts (optional) and serve immediately with lime wedges. Add baked tofu if desired.